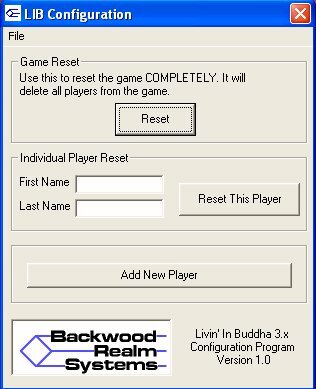 Having watched my prized creation go unfinished in 2002 due to a BAD incident with ANOTHER Linux installation gone bad, I lost my latest code for Livin' In Buddha, which was slated to be version 3.0. Late in '02 I discovered a CD-ROM that had a compiled version of a Beta I had loaned to a friend for testing. It seemed that there was no way to modify it, though, since it was in executable form. Upon further examination, I discovered that I could edit the .EXE with a hex editor (duh! ), so I had at it. I modified my title screens and etc to say "Livin' In Buddha Version 3.1 FE", with FE standing for "Final Edition". I also discovered that I had code close enough to current for the TrackEd program, and that I could make LIB.EXE work with a front end that would design the player files so they would work with ANIVETTE.EXE correctly. We were back in action in LIB development one last time! The new title screen mixed the old title box and text from versions 1.0 to 1.3 with the idea of a menu-based title screen that has roots in version 2.0/2.1. The "front end" to make the Beta go as a full version. This program allows LIB 3.1 to work with the external Chevette races module. Besides, it was nice to finally have a windows-based program as part of the LIB package. Both 32-bit (Windows 95-up) and 16-bit (Windows 3.x) versions were coded. It took a little while to figure out how to get around code errors I couldn't fix (not actually working with code makes this TOUGH! ), but in about 3 weeks worth of programming the final result was finished. You can read more about it and download it here. About this time, between LIB FE and the absolute completion of TBWR v2.0, Melissa and I got the apartment we had in Oolitic (in April.) Finally got out of that pitiful trailer...life seemed to be moving faster and faster. I had more plans for E3 as well, and did a bit of development. Problem is, I've found that DOS gets more and more dead as time moves on. Windows XP and 2000 both have much more DOS "hatred" than past MS Windows versions, so I'm beginning to shy away from programming all together. I may finish it as a super-nerd "DOS WILL NEVER DIE" project, it's hard telling. I also started a project called "BQ Pro", a user-programmable Bible Quiz game written in Visual Basic 6. Its fate is unknown at this time. I began my first web site with it's own domain, entitled "The Backwood Realm", the current version (v5) can be viewed at the URL http://www.backwoodrealm.com/index2.htm at this writing. It had its roots in the very last freeyellow.com site I did, and version 1 of TBWR was indeed never on the server that the current site was on. I decided to use "version numbers" because of the nerdy feel of the website in general...so in correct computer programming fashion, "The Backwood Realm v2.0" was born on January 28, 2003 at the url of http://www.geocities.com/kb9snl. In April I invested in the domain name of www.backwood-realm.com. At the time, backwoodrealm.com was taken, so the domain name selling sites seemed to claim. That was the reason for the dash. The overly-illustrious v2.1 site - Cool, but WAY TOO HARD TO MAINTAIN! As we trucked quickly into the fall of 2003, I was still a Meat Cutter at Mills Market. Needless to say, I was more than a little depressed about the situation. The pay was pretty crappy, which kept us in basic poverty. I had needed that job in college, as the hours were very flexible. In August, we learned that Jay-C was buying us out, due to the fact that the small business had basically spent all the resources it had trying to remain a competitor, but still ended up having some money issues. Paychecks began to bounce. I considered my options as we were all taken into a meeting telling us our options as employees of Mills Markets, Inc. I interviewed for a position with Jay-C. During that interview, I stressed how I wanted to begin my career in Information Technology to the guy (I believe he was actually the main HR guy for the Jay-C division of Kroger), and things really actually started to swing in that direction. Yet, there's another twist in the story. The previous June, my mom had called me and told me about an ad in the help wanted section of the local classifieds. "Cook Incorporated presents a job fair, June 23 at the Bloomington Convention Center". Huh. I'd never heard of this Cook Inc. (which may surprise those from Bloomington reading this page), but it sounded like a big company with big opportunity. "Besides," I told myself, "anything beats cutting meat for a living." Then came late September, 2003. We knew the store was closing, but had no clue when this would take place. Jay-C employees were there every moment the doors were open, basically to protect their interests. After months of not hearing from Cook, they called one day while I was helping "Mamaw" Marcy create invitations for her wedding vow renewal ceremony that coming October (Her 50th anniversary), and let me know that they would like to offer me a position in the Final Packaging department. I took it, because I knew that anything I got there would be better than anything Jay-C had to offer. When I turned in my notice at Mills, the back office lady told me she thought they were going to give me an IT position at the Seymour Jay-C offices. No matter, because I wasn't going to risk that NOT happening and being stuck in a grocery store forever. I knew I had more sense and brains than that. Retail was of no interest to me whatsoever. Regardless, that quote from her would resonate in my mind off and on for the next three years, as I seemed stuck in production at Cook.